Twenty-nine years ago, the Iranian Resistance experienced a major overhaul in thinking and practice by investing all its assets on the leadership of women. On October 18, 1989, Massoud Rajavi, the sitting Secretary General of the PMOI, passed on his mandate to Maryam Rajavi who had already shared the post as joint-leader since 1985. In appointing her, Massoud Rajavi said, she had proven to be “uniquely qualified” to take on the leadership of the main Iranian opposition movement with 120,000 martyrs and 20 years of struggle against two dictatorships. Maryam Rajavi’s rise to the leadership of the PMOI/MEK was a response to the sacrifices made by tens of thousands of brave PMOI women who had taken great risks, withstood horrendous tortures, and given their lives to defend their people’s rights. At the same time, it was a declaration of war on the mullahs’ misogynous culture and fundamentalist vision and practices. In this capacity, Maryam Rajavi overhauled the whole structure of the organization, paying the price of offering equal opportunities to women in all realms of struggle which were previously occupied only by men. In this way, women found the possibility to believe in their own power and gain experience. At the same time, men needed to totally change their attitudes and vision towards women, something that was gradually realized in the organization as women proved their qualifications and competence in every field. On the other hand, women’s participation in leadership could never be realized without the cooperation of emancipated men. Women’s active presence in all the arenas of struggle enabled the PMOI to introduce new methods and practices which improved its adaptation to the sophisticated struggle against the mullahs’ regime. Four years later, during its plenary session, the National Council of Resistance of Iran, a coalition whose members include a number of Iranian opposition organizations and prominent personalities, elected Maryam Rajavi as the President-elect for the period of transitioning power to the Iranian people. The election was made public on October 22, 1993. The NCRI acts as a parliament-in-exile and a legislative assembly. As the President-elect of the NCRI, Maryam Rajavi has launched an extraordinary political, social, cultural and ideological challenge to the ruling fundamentalist mullahs in Iran. Over half of NCRI members are women. They occupy various political, diplomatic, social and cultural positions in the Resistance. With the guidelines of Mrs. Rajavi, women have gained remarkable victories for the Iranian Resistance in some of the most challenging legal and political battles. Maryam Rajavi has been particularly focused on the real message of Islam, i.e. tolerance and democracy, contradicting the reactionary and fundamentalist interpretation of Islam. She believes that one of the most important differentiators between these two entirely contradictory views of Islam focuses on attitudes toward the status of women. After her election as NCRI President-elect, Maryam Rajavi relegated all her previous responsibilities in the PMOI to an all-woman Leadership Council who took charge of all affairs in the organization. In 1994, during a speech delivered at the Oslo city hall, Mrs. Rajavi warned about the octopus of religious tyranny and Islamic fundamentalism whose heart beats in Tehran. She said: “Fundamentalism has turned into the greatest threat to peace in the region and the world.” This is what the world has just recently come to understand its truth. Over the years, Maryam Rajavi has been the pioneer of the struggle for democratic change in Iran. She has introduced a Ten-point Plan for a free and non-nuclear Iran where death penalty is abolished, and also a Ten-point Plan on women’s rights and freedoms calling for women’s participation in leadership of the future Iran. Maryam Rajavi has led a global movement comprised of some of the most celebrated political, social and military personalities from the U.S., Canada, Europe, and Australia, attaining significant victories in support of regime change in Iran through recognition of the Iranian Resistance. Mrs. Rajavi led a major campaign to remove the PMOI/MEK from terrorist lists in Europe and the U.S. These efforts led to the delisting of the MEK in the United Kingdom in 2008 and the European Union in 2009, as well as the dismissal of terrorism charges in the June 17, 2003 dossier by a senior French Investigative magistrate in May 2011 and the revocation of the MEK’s terrorist designation in the United States in September 2012. 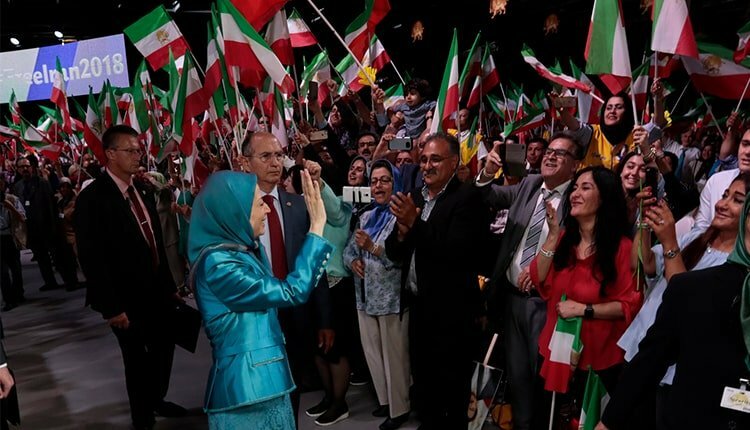 Maryam Rajavi also launched a 14-year international campaign to protect 3,000 defenseless and unarmed PMOI/MEK members in Ashraf and Liberty who had suffered more than 100 deaths and some 1,000 injured in ground and missile attacks by the Tehran regime. Meanwhile, Maryam Rajavi’s women led the 14-year steadfast perseverance of the PMOI/MEK under the most difficult conditions when the organization was under siege. These relentless efforts eventually led to the safe relocation of all PMOI/MEK members out of Iraq, a process which was completed on September 9, 2016. In August 2016, Maryam Rajavi called on the people of Iran and all Iranians around the world to join the movement calling for justice for victims of the 1988 massacre in Iran. The movement called for the prosecution of all perpetrators of the 1988 massacre, demanding a list of all victims and their mass graves, as well as a list of everyone involved in making decisions or carrying out the executions. The Call for Justice movement compelled the regime’s leaders to speak up about this horrible crime against humanity after 30 years of silence. And in the final days of 2017, a nationwide anti-regime movement emerged and has continued ever since. Most recently, Iran’s truckers and truck owners held a strike in over 300 cities across the nation, followed by another cross-country strike by bazaar merchants and a teachers’ sit-in strike in 26 out of the country’s 31 provinces. The clerical regime officials and leaders have acknowledged that the organized protest movement is organized by the PMOI/MEK. Today, regime change in Iran is looming in the horizon. This would have never been accomplished if the movement did not enjoy a clear-eyed vision on gender equality, empowering it to mobilize all the energies, intellect and potentials of its members towards toppling the mullahs’ regime. Maryam Rajavi bears the credit for initiating and leading this revolution in the visions, hearts and minds of the movement’s men and women who are equally effective in struggle against the Tehran mullahs and their inhuman gender discrimination which has subjugated the society.